If you are what you should be, you will set the world ablaze,” said St. Catherine of Siena, a 14th-century Dominican sister. Today Dominican sisters around the world are heeding this advice. Ministering in over 103 countries, they are making God’s love and mercy more audible and visible in the world. When I recently visited with Dominicans in Eastern Europe, I found them rediscovering their vocation as preachers—inspiring, ardent, at times even incendiary—for a world that sorely needs them. During the Communist period, Dominican sisters were forced to practice their religion “in secret.” They could no longer live in community or wear their religious habits. Their properties were confiscated, and they were forced to engage in secular activities to earn their keep. For 40 years they worked in factories and at tedious tasks. Prior to this period of oppression, however, our sisters had worked as high-level professionals: psychiatrists, philosophers and professors. In July 2008 I went to Eger, Hungary, to give a preaching workshop for 70 young sisters from Hungary, Slovakia, the Czech Republic, Latvia, Belarus, Ukraine and Germany. Though all were under age 40, they had experienced Communism and the changeover in their respective countries. Every one was truly marked by this experience. The spying on and persecution of family members and the cynical skepticism took their toll and left scars. One sister recalled an incident from her childhood, a day when the police came to her house and took away her father because he was accused of being against the ruling Communist party. Each day after she would ask, “When is Daddy coming back?” He did return five days later, but, she recalled, “Only half of him really came home. He changed; he was silent and withdrawn.” After that, it was difficult for her to trust; she never knew when and how someone in her family might disappear and be damaged. The culture that remained now struggles with depression and a tendency toward guardedness and all-abiding secrecy. Convinced that the proclamation of the good news of the Gospel is a powerful antidote to the post-Communist mentality, the Dominicans initiated the preaching workshop. Through preaching, they try to re-engage with the communities where they once lived. Because of the hidden ways of the past, the sisters felt called to make their preaching explicit and clear. It had to be forceful, unambiguous and appealing to attract the people of their day and make a difference. The preaching workshop reminded me of some elementary truths and untruths about our Dominican identity that have inserted themselves into our thinking over the years. Sometimes Dominican sisters relegate preaching only to those among them who hold advanced degrees in theology. At other times, consciously or unconsciously they equate preaching with the homily we laity are not allowed to preach. The sisters forget they are preaching at all times. As St. Francis of Assisi said, “Preach the Gospel at all times; if necessary, use words.” Preaching is at the heart of the Dominican vocation, its animating, pulsating lifeline. Those who teach, nurse or do other ministries are proclaiming the good news through their work. Just as the covenant was written on our hearts in baptism, so, at Dominican profession, preaching is written on the sisters’ hearts. Whether in word, deed or relationship, they are to engage in it as a public act that manifests God’s presence with and among God’s people. Each month Sister Regina, a Dominican in Zambia, brings food stamps from a European aid agency to Umbela, a grandmother whose daughters and their husbands have all died of AIDS. Grandma Umbela lives with her 13 grandchildren in a hut without electricity or plumbing. The doors are not on hinges, so it is easy to see that the cupboard is bare. Umbela was happy to receive Regina and me as guests. Upon our arrival, Umbela immediately took down the only thing left on the shelf, the bag of peanuts she had just picked in the field, and offered them to us. The Missionary Dominican Sisters of the Sacred Heart in Zambia have 46 professed sisters, 35 junior sisters and 8 novices who live in 7 apostolic communities. They have established two grant-aided high schools and three basic community schools (for children who had not attended any school and were too old or too poor for the government basic schools). Most of the children in the three basic schools—900 of them—are orphans or vulnerable children. The sisters also maintain five homes for orphans who attend primary and secondary schools and provide for girls who are H.I.V.-positive or who are physically or mentally handicapped. The sisters staff a rural health center and run a mother and child care program and an extensive outreach service. The nurses travel to scattered villages offering health services, including home-based care for H.I.V. patients. Serving the poor daily is their way of incarnating St. Dominic’s vision. As the story goes, Dominic, following his mother’s example, responded to those suffering from famine in Palencia, where he was a student; he sold his books to feed the poor. He could have said, “This isn’t really my problem, and besides my studies are more important.” But he said, “Why save dead skins when live ones are starving.” And Dominic altered his cherished devotion to study and taught that study is useless if it does not benefit the poor. As women of learning and experience who employ knowledge to change society, Dominican sisters around the world proclaim the Gospel of justice and peace. Most of the sisters in Africa proclaim it through direct service, while those in the Northern Hemisphere do this along with advocacy to bring about systemic change. Wherever I go, I see sisters working to eliminate poverty and hunger, to achieve universal primary education, to empower other women, to reverse the spread of disease and to ensure environmental sustainability. In such ways they preach the just word, proclaim the Gospel of mercy and set the world ablaze. God bless the Sisters they are brave witnesses. They valiantly resist being homogenized by Campus Life. Up here in Canada its unfortunate that the men are less courageous. One will see the Habit at a Mass (if one of the Friars is president at the Mass), however others will not wear their Dominican clericals if he assists at Mass. 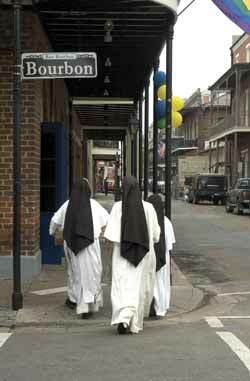 I asked a very earnest young Dominican why no Habits outside Mass and was told that Cardinal Leger of blessed memory prohibibited the local Province from wearing their Dominicans when away from Church property... That people feel "weird" or "uncomfortable" should they wear such clothes away from the local Church grounds. I suppose that a dead Cardinal gone to his reward has more authority than subsequent Popes concerning public witness. Its really a lost opportuntiy for public witness and also an opportunity for the wearer to humble himself. God bless them though, they are doing something by making the effort to wear their Dominicans at all. Its interesting to note that the early Habits were cut in the shape of the Cross. Merry Christmas and Happy New Year! This article also appeared in print, under the headline "Preach at All Times," in the January 5, 2009 issue. Margaret Ormond, O.P., a Dominican Sister from Columbus, Ohio, works as a consultant with religious women in Africa.